There are many things to remind me that I am no longer in the US and am back in the tropics…that we are heading into summer while the northern hemisphere rolls into winter. 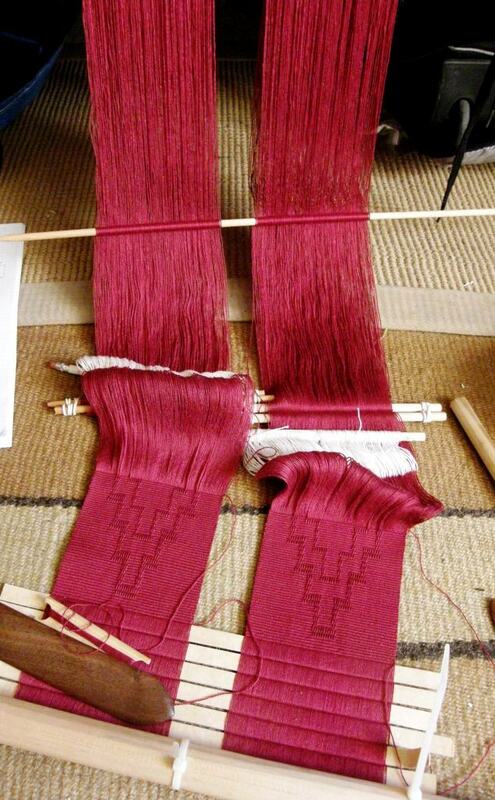 There’s this picture that was taken by an online weaving friend in Vermont today…. I keep scrolling back to gaze at it as I write my post in the heat. I lived 6 years in ski resorts and can sense the strange way that sound gets muffled when snow has fallen as I look at this picture. I love its cool blueness. 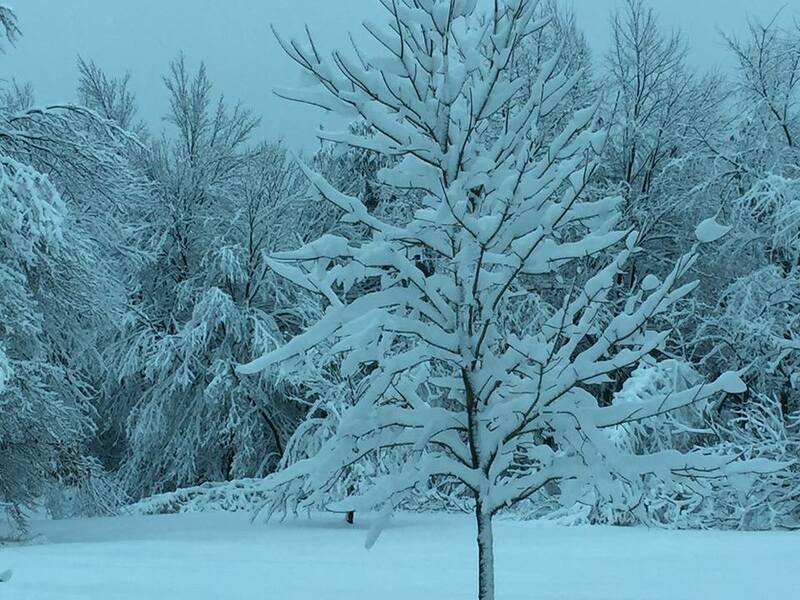 I have been pulling my hair out all day because my internet connection has been particularly horrible…on and off every 30 seconds….while poor Susan in Vermont is without power in a snowstorm. I wonder how my Californian friends are doing with the massive rain storm that was predicted. 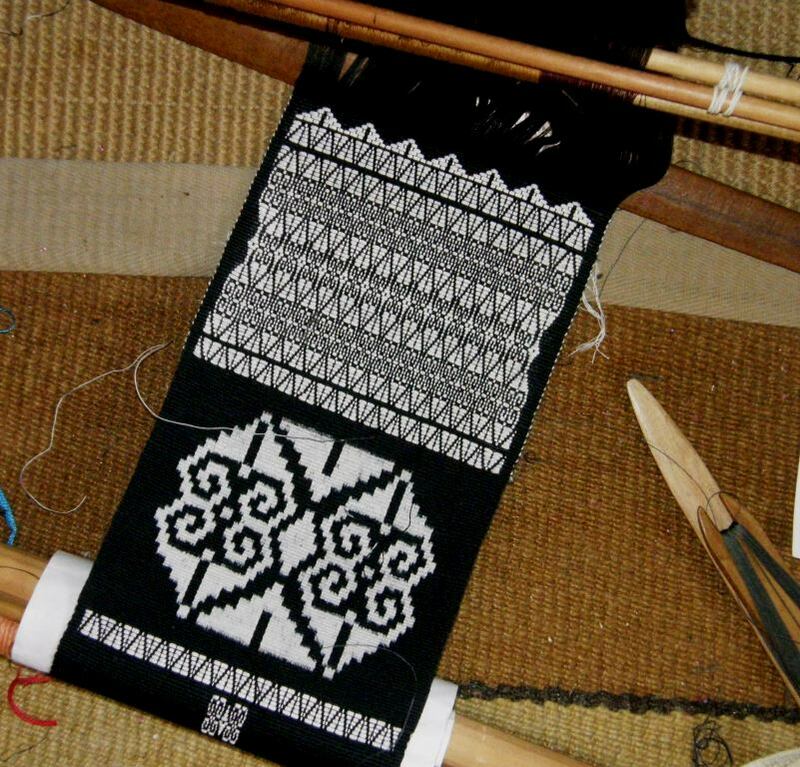 It’s been one of those weeks where I spent far more time online than at the loom. That is not such a bad thing. I got a lot done even if it was at a very slow speed. And, while emailing away and doing research, I ran across a very cool video. 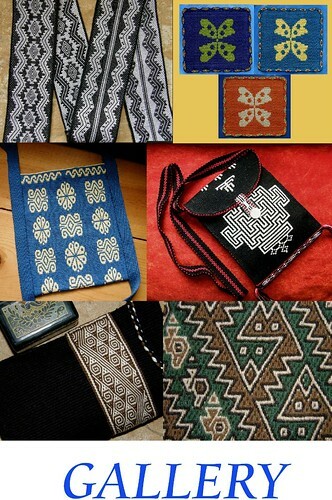 Last year, while visiting with my weaving friend, Dorothy, (the one who recently studied with Peruvian tapestry artist, Maximo Laura) I saw some of the textiles that she had collected on a previous visit to Peru. 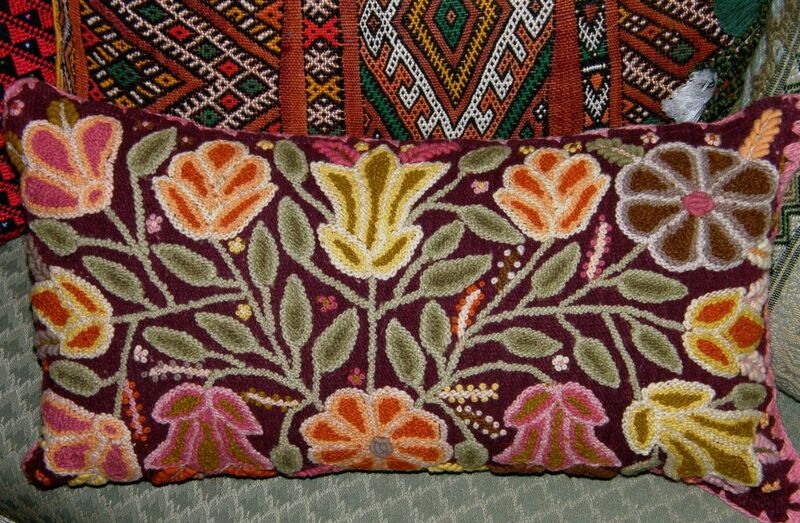 One such piece was a pillow cover with some beautiful embroidery. Both Dorothy and I were curious about the embroidery stitch that was used to create the stems and filled-in areas. I posted pictures in a post following the visit and readers wrote to tell me of the origin of the piece…the province of Ayacucho. I had been to the city of Ayacucho in 1996. That was shortly after the capture and imprisonment of the leader of the Shining Path movement which had used Ayacucho as the base for its terror activities. The city was a sad, depressed and desolate place at that time with few signs of activity and a mere handful of weavers still at their floor looms in the Santa Ana area. I hear that the city’s artisans have long been back at work producing all kinds of both traditional and contemporary handcrafts. 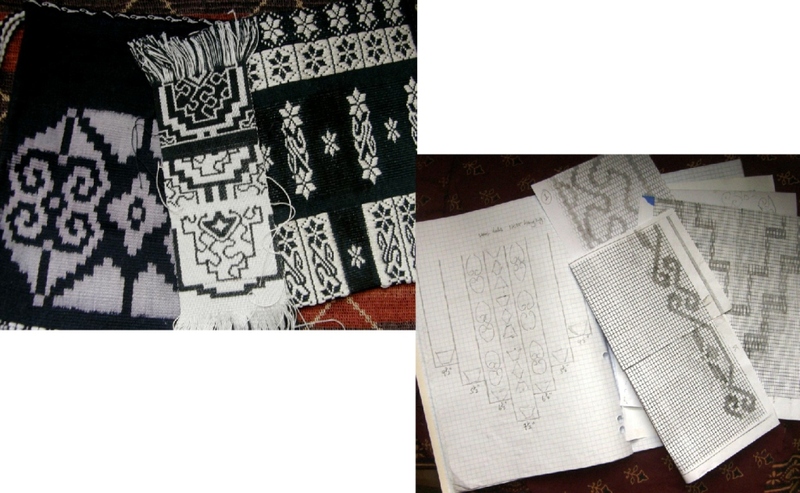 Mariana Venegas wrote to me immediately after I posted these pictures last year and sent me diagrams of what she believed the stitch to be. She was right. But it was one of those things that I did not examine very closely, filed away and forgot about. Thank you so much, Mariana! Coming across the aformentioned video reminded me that I had wanted to learn how to do the stitch. In the video it has been named punto crespo. 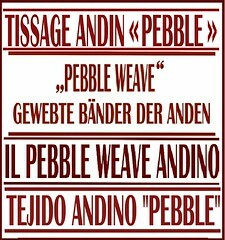 In Bolivia, hair that is curly or frizzy is described as being crespo so, I guess I could safely say that it is the “curly stitch”. Anyway, here is the video for anyone who is also curious. I would like to use this stitch in some way in my work. Ayacucho is one of the places I would very much like to revisit as I see so much beautiful handwork coming from that area online. …not that I want to buy anything, photos will do…I am busy trying to find new homes for some of my things these days! Here is a picture of some paintings done in Ayacucho from the Facebook page of Folt Bolt. I recommend going to Facebook and “liking” that page. The things that are posted there are a constant source of inspiration. Sarhua is a village in Ayacucho, Peru. 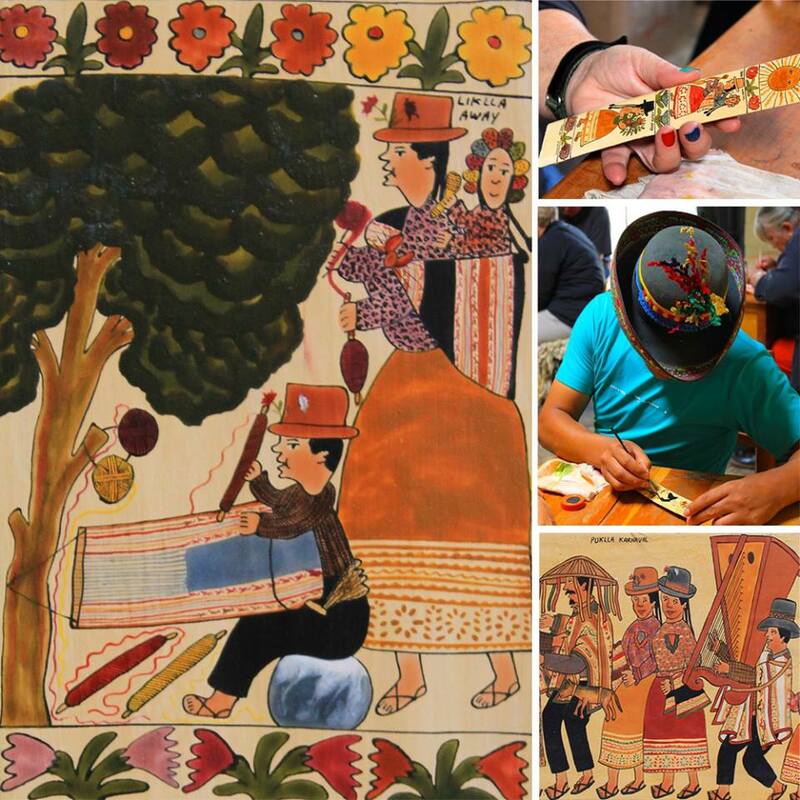 Tablas (boards made from the stock of the century plant) are painted using natural pigments extracted from the earth around the village and also from the leaves/flowers and roots of plants. Each member of the family must be reflected in the tablas, performing their every day work or enjoying a special day or festival. A tradition is gift-giving of a tabla to a friend or family member building a new home. These are usually 6 – 8 inches wide and up to 10 feet long and are attached along a ceiling beam on the second floor for good luck and protection. 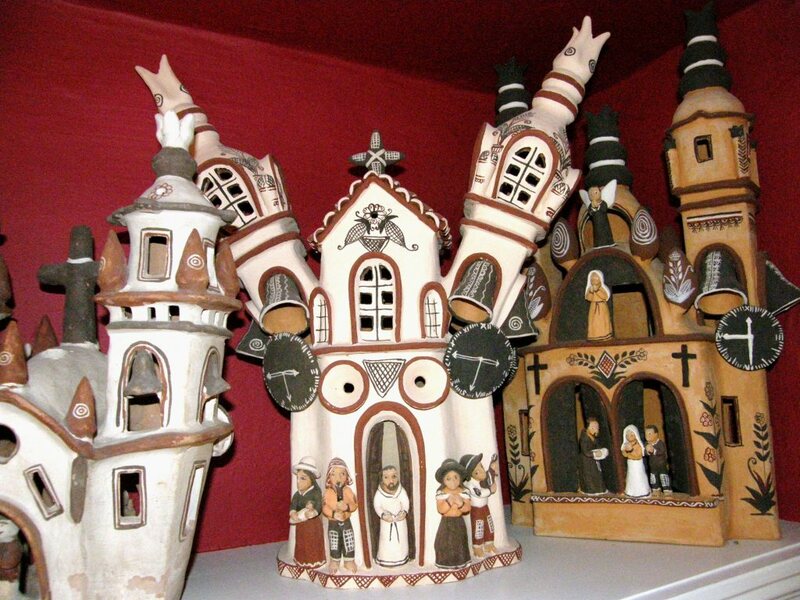 I do remember these marvelous ceramic churches in Ayacucho. Not only were miniature versions offered for sale in some of the stores in the city, but large ones sat on the rooftops of many of the houses in the surrounding suburbs. The examples, above, are part of Gay’s collection of textiles and folk art that I saw in her home in San Diego on my recent fall trip. Gay, by the way, is very keen to sell most of the items in the collection and would welcome any enquiries. Just leave me a message here on my blog. As for the title of this post, Plain Tales,…that is what I have decided to call my second series of three red-black-and-white wall hangings. Why “plain”? 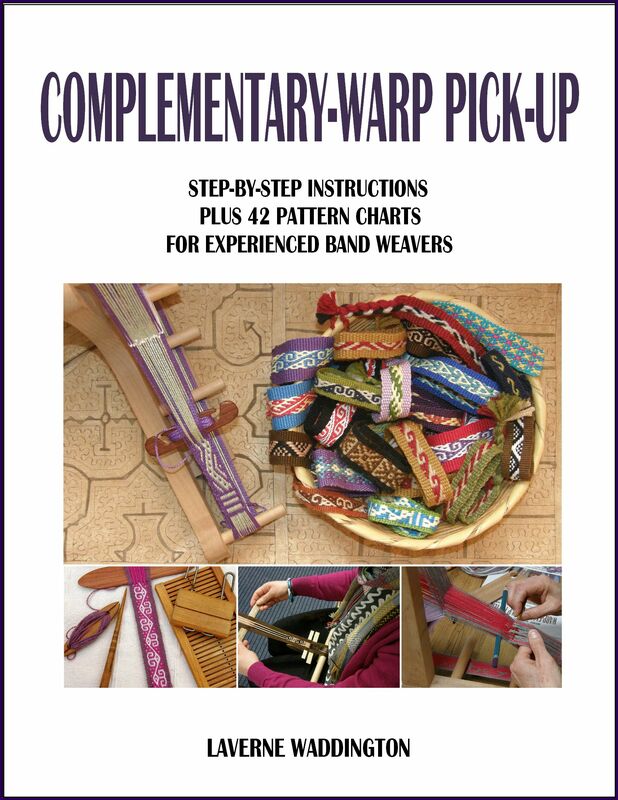 Because they are all based on warp-faced plain weave….. a black warp-faced plain-weave panel patterned with white supplemental weft, two bonded layers of warp-faced plain weave, or double weave, and warp ikat, a tie-dyed warp woven in plain weave. Each has a tale to tell but not only about what was involved in creating it. 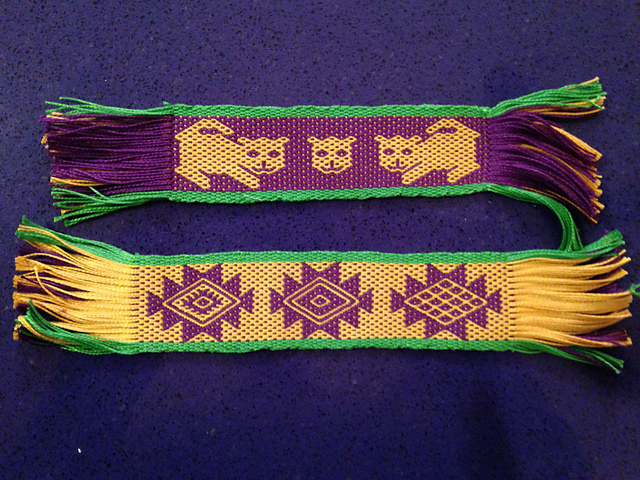 Each has a story of the encounters and experiences I have had here in South America, and beyond, learning to weave on simple looms. From the time spent at a raucous highland festival in the town of Calcha where I first spotted the women’s tiny floral hat bands amongst the dancing and celebration, to my first encounter with ikat in the form of my weaving teacher’s martital bedspread. The tied pattern included her name and her husband’s. 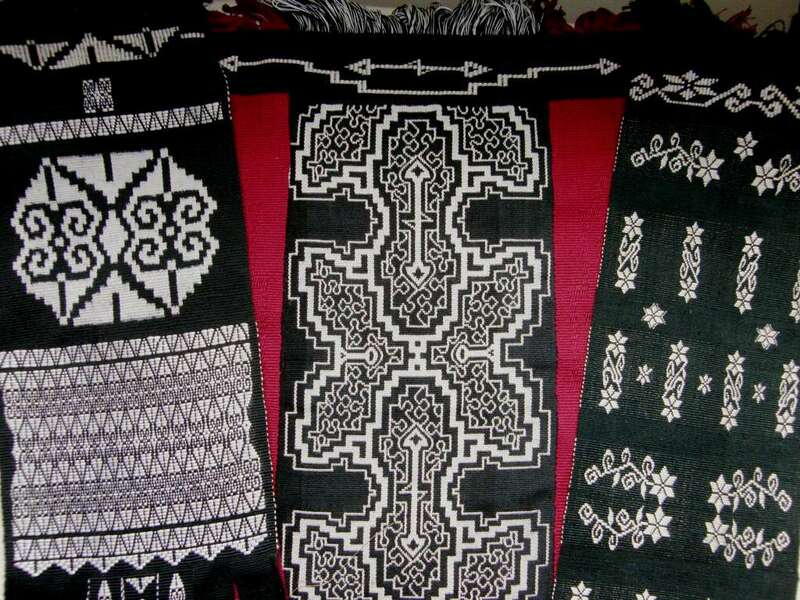 The Shipibo-inspired piece reminds me of the three weeks I spent on my knees doubled over at the horizontal ground loom learning double weave with my teacher laughingly telling me q’ella! (lazy!) and jokingly threatening to slap me when I didn’t beat hard enough! 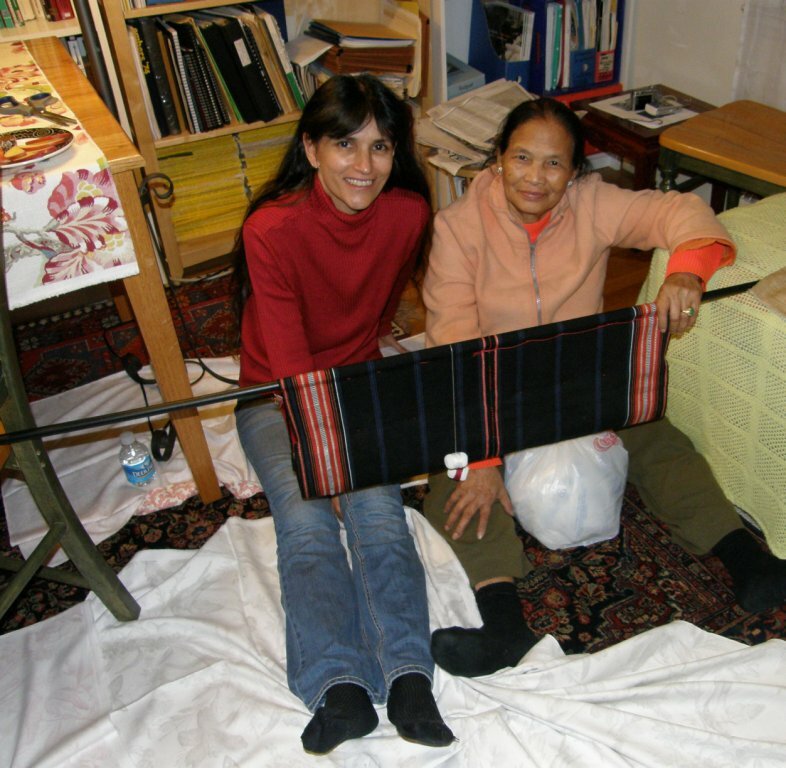 As I sit twining, I am taken back to afternoons spent with my Montagnard teacher, listening to her stories about her overpowering desire as a child to learn to twine, abandoning her chores and risking her mother’s anger to run off secretly to another village to sit and study with her sister-in-law. All three Plain Tales are off the loom now but not finished. There will be a great deal of tv time spent braiding and twisting fringe. 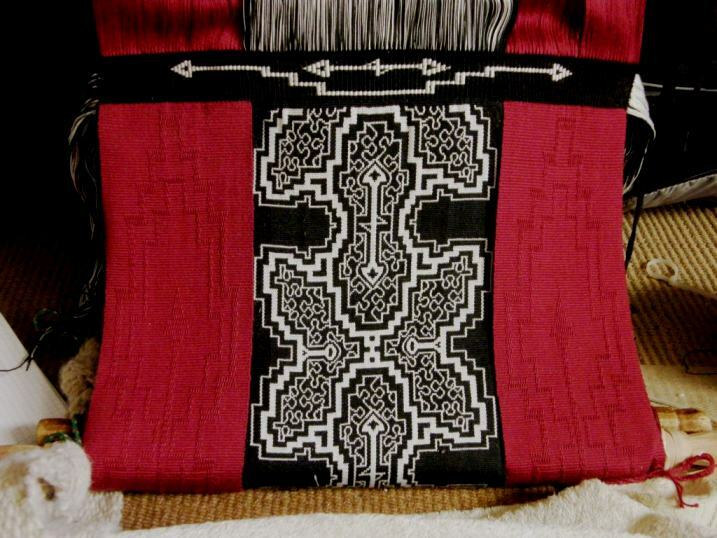 I re-did the red panels on the first of the three pieces to be completed and had, therefore, to re-do the weft twining that connects the them to the central black-and-white one. 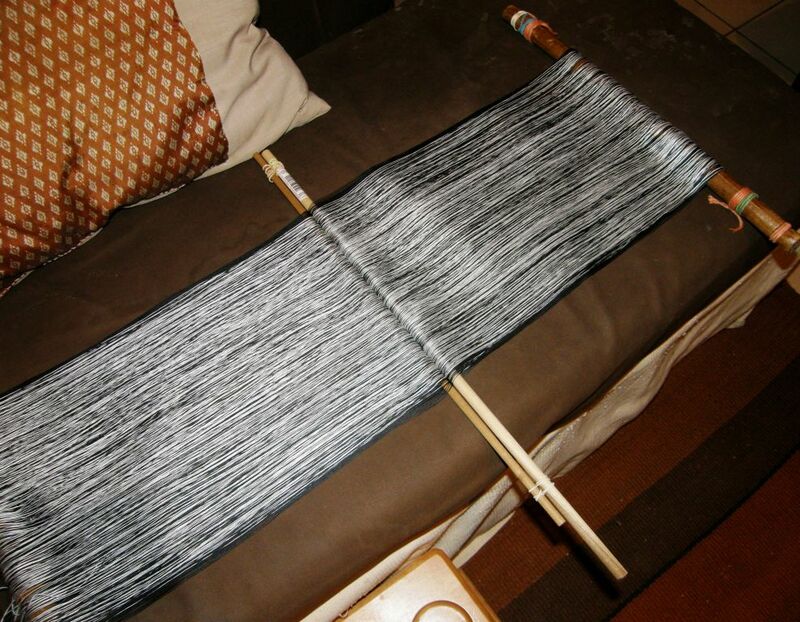 Each row of weft twining took 40 minutes! Now all the red panels match in structure and color. It has been so exciting to see this blank slate…. And to see these experiments…. 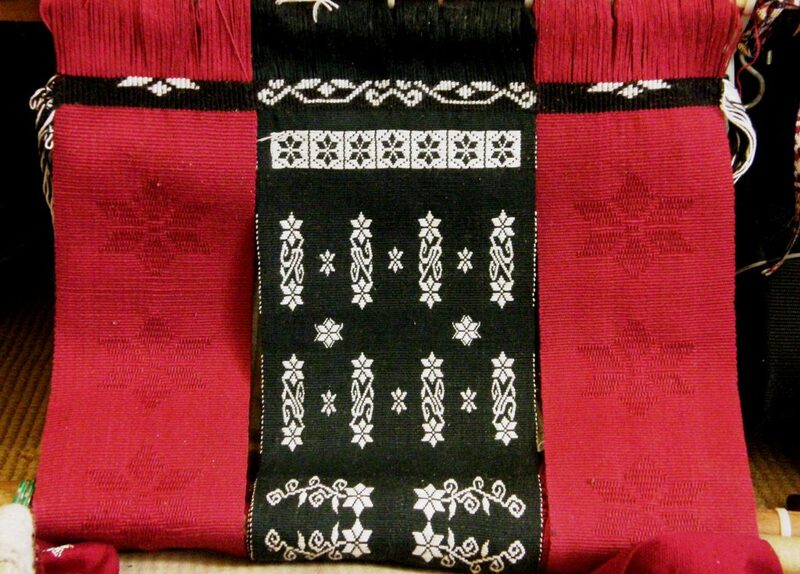 After completing the relatively chaotic black-and-white center panels for each hanging it was always been soothing to then be able to sit at the loom and turn out plain red cloth with simple warp-float motifs. These quiet red panels flank the black-and white ones. 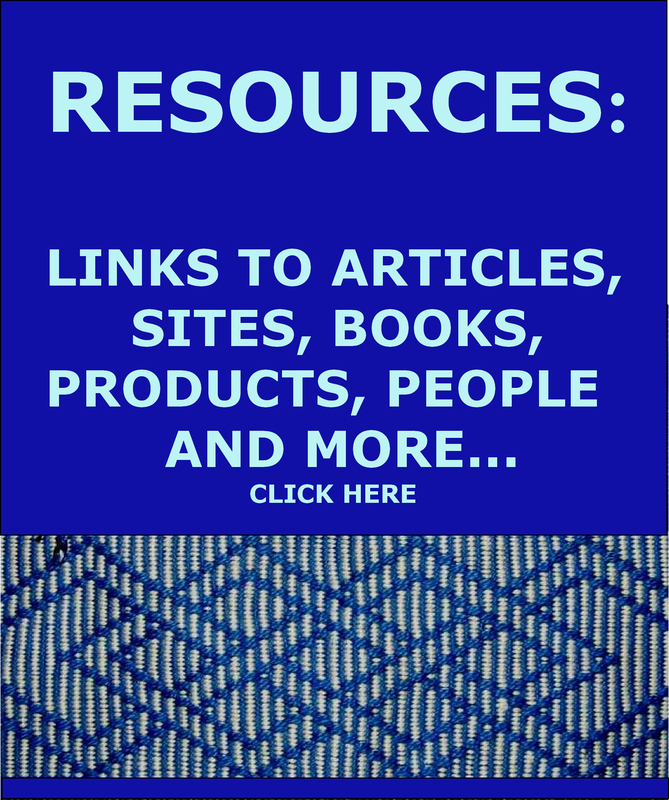 What’s next?…more ikat! I am in the process of figuring out a new frame so that I can sit in a more comfortable positon while doing all the tying. I have a new idea for the ikat which will need sampling and I am pretty excited about it as I really don’t know what to expect. I brought back LOTS of black dye from the US this time so there will be lots of room for error and adjustment in the sampling. I will leave you with a fun original design by David. 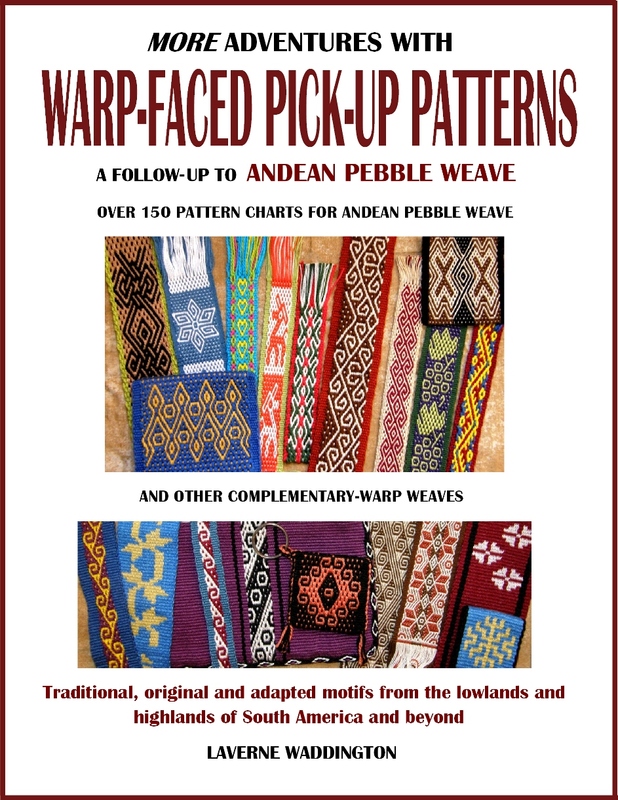 He wove some star patterns using the Andean Pebble Weave structure based on Guaraní designs that I charted in my second book. Then he went on to use the tutorials on designing to create his own cat motifs. They are adorable! Beautiful, Laverne. Congratulations on completing this incredible piece of work/art. Inspiring, for sure. Your work is fabulous, Laverne! Absolutely gorgeous! An inspiration to all of us. Happy Holidays and thank you for sharing these textiles and techniques with all of us. Your work is so mature, Laverne. I can’t fathom how it must feel to complete such rich pieces, full of learning and memories. Wishing you continuing joy in your development. Thank you so much, Tracy. 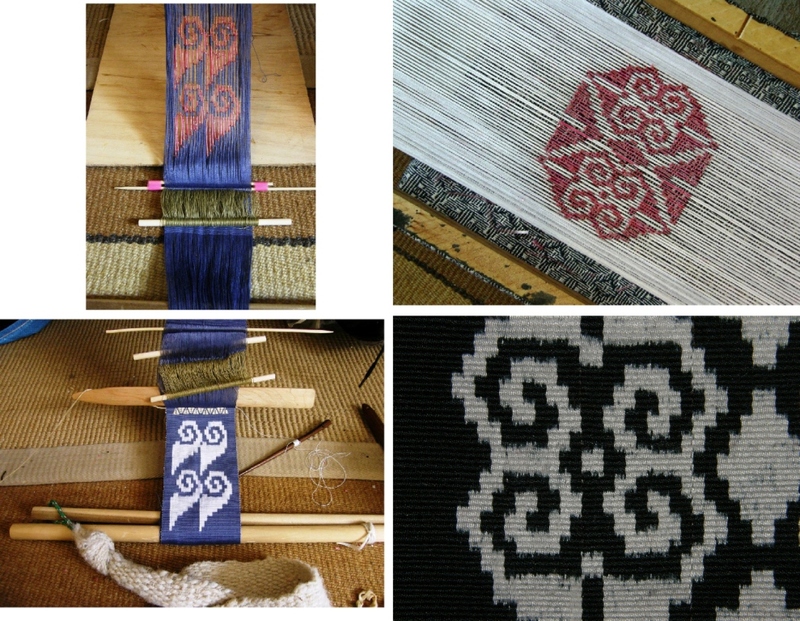 I think that traveling and taking breaks from the loom is helping me a lot to think about and develop these bigger projects that incorporate what are now two decades of experiences.